We have compiled a list of what we think are the most common questions that prospective customers would require the answers to before employing us for our decorating services. Please click on the questions below to reveal the answers. +Q: How much does it cost to paint a 3-bedroom house? Let’s assume the basic bedroom size is 3m x 4m, and the ceiling is 2.4m high. This estimate would include the use of Dulux trade or Crown trade paint. We can also offer you a 10% discount on the total cost when we complete work in January. +Q: Will you do a good job? A: We take pride in completing each job to the expected standard and will always aim to exceed your expectations. +Q: How long will it take? A: Each job is different, and we will give you an estimated schedule when we quote. +Q: What is your availability? A: We will give you our availability at the time of quoting. It may change from day to day, so please check again when you are ready to go ahead. +Q: Do I need to buy the paint? A: If you want to buy your own paint, or you already have it, that’s fine. We recommend trade paint – if this word is on the tin, the paint is of a better quality than retail paint, even with an expensive brand name. We are happy to buy the paint on your behalf, as generally, we can get the paint at a lower price than our clients and it is our responsibility to get the right type and finish. +Q: Will you move the furniture? A: We are happy to do it – we will charge £30 per hour per person for this service. +Q: Can I leave you the key? A: Absolutely, our operatives are completely reliable They have been with us for at least 6 months, and most of them have been with us for years. We wouldn’t employ anyone whose integrity is in doubt. +Q: How would you like to get paid? A: We ask for a 10% deposit at the time of booking. We take weekly interim payments on larger project, and the final payment on satisfactory completion. Please refer to our Terms and Conditions. +Q: Can I get a discount/are your prices negotiable? +Q: Do you hang wallpaper? A: Yes we do. A guide cost for labour is £80 per roll, this can be reduced on plain walls (no windows, faceplates, lights etc). +Q: Can you decorate over the weekend? A: Yes – we charge 150% of our standard rates to make sure our decorators receive fair pay for their work. This might be a more practical option for businesses, who don’t want disruption to their company. For homeowners, we are happy to hold your keys if you would prefer us to work in the week. +Q: Do you have any references? A: Yes, we have been trading since 2006 and have a large portfolio. Please ask and we will find a client that you can speak to. +Q: Where are you based? What areas do you cove/how far do you go? A: From our base in Bromley, South London, we cover Greater London, North Kent, North Surrey and Essex. +Q: Is this a company or a one-man band? A: We are a well-established company with a number of independent contractors operating under our brand. They are very experienced and have been with us for a long time. If you are a domestic client, you will be dealing with our local operative from start to finish. If you are not happy with any aspect of their work for any reason, Brush Strokes will organise a replacement or correct their work without any additional charges – please note, this is incredibly rare as our operatives are experienced and thorough in their work. Larger or time limited projects can be taken over by our commercial team. +Q: Will you rub down all surfaces? 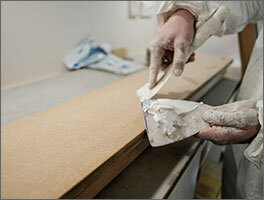 A: Woodwork must be rubbed down before undercoating – it’s all in the preparation. We also sand with fine sandpaper between coats. This is not the case with emulsion being painted over with emulsion, as the sanding of walls doesn’t improve adhesion of new paint. It’s an easy way to make the surfaces smooth and even. +Q: Will you wash walls? +Q: Will you paint two coats? A: We follow manufacturers’ instructions. Generally, one coat is not sufficient to achieve a nice finish, even if it doesn’t affect durability (in the case of an interior). The exception would be a ceiling that gets sprayed. Spray application distributes the paint in such a way that one coat can be very thick, and on a ceiling, it won’t run. On a rare occasion when internal walls are being repainted with exactly the same colour, one coat may be sufficient. On the other hand, with some colours, and especially with Farrow and Ball paint, three coats are necessary. With gloss, undercoat is strictly required – satin and eggshell are self undercoating, so two coats are needed. On the outside, the number of coats is really important as more coats will offer protection against the weather. We usually paint two coats of masonry paint on walls and three coats of an appropriate paint system on woodwork (this doesn’t include primer and stabiliser). +Q: Do you offer repairs? A: We can complete small carpentry repairs like the replacement of a window sill or a skirting board – we have a plasterer working for our company. For any other trades we can recommend good people. +Q: Do you give free no obligation quotes? +Q : Why are you more expensive than my neighbour/friend? A: We understand that we will not win every job and there is always a way to get it done cheaper. Chances are that your friend or family member may need some advice – please send us an email and we will try to help. If they can do the job well – maybe they would like to work with us? +Q: How many quotes should I get? A: Three quotes is reasonable, especially if you have done your homework and researched the companies. Some get many more to find the cheapest, but it takes time and often you can end up with a bad service. Some tradespeople will never get back to you with a quote. We never do this – you can count on us to supply one of your three recommended quotes. +Q: What is the nationality of your painters and do they speak English? A: Our painters speak English, not always at the highest level (this includes those born in the UK!) but they will be able to advise you on decorating matters. Our painters are eligible to work in the UK, skilled, polite and honest. +Q: Do you know other trades? A: We are well connected to many trades and will be happy to recommend the good ones. +Q: How quickly will you provided a quote? A: We usually provide a quote within two days. If we are very busy and know that it is going to take longer, we will tell you. +Q: Do you use Farrow and Ball Little Green Fired Earth Mylands and other designer brands? A: Yes, we do. Our quotes generally don’t allow for designer paint, please expect additional cost. It may cost more not only because of the product price, but also because there may be additional coats required, and this means more labour. +Q: Does it matter which colours I choose? A: Yes, it does. Tinted paint costs more than white or magnolia and it cannot be returned. It also depends on existing colours that need to be covered – strong dark blues and browns may take four/five coats to disappear. Reds and yellows don’t cover well and usually need and extra layer. If you are looking to repaint a brown with yellow, please be prepared for additional cost and time. Repainting with the same colour is much easier. +Q: Do we need to move out for the decorating? A: Usually it is not necessary but there will be some inconvenience to the residents. We will do our best to minimise this and work around you, but you will need to adjust a little bit, too. The best time to discuss logistics is when we come to quote. Each area has its own problems, but probably the hardest for us is the staircase. It’s hard to work when residents go up and down and painters are working on ladders.